One of the ways women are drawn into Mary Kay is with false earnings claims. Look at all the money that is being made! Anyone can do it! You can make a full-time living working part-time hours. Your Mary Kay recruiter and her sales director will tell you that you can make $20 or $40 per hour, or maybe even more. That sounds like a lot, especially if you can do that from home. You can do that while being home with your children. You avoid the commute. You don’t have to pay for child care. The advantages are just stacking up. The first item that’s featured is the MONEY. 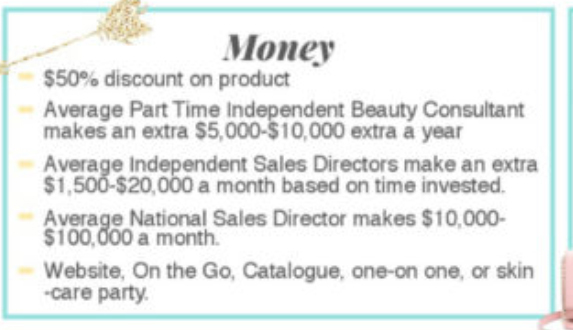 Dacia says that the average PART TIME consultant makes an extra $5,000 to $10,000 per year. Oh really? Where does she get that number from? Is that from her own unit? Is she willing to attest that in her own unit, the average net profit of her consultants is $5,000 to $10,000? Some are making more and some are making less, but the average is $5,000, to $10,000? Dacia knows darn well that’s a lie. The company doesn’t keep these statistics, and neither does she. In fact, she knows full well that her consultants are making much less than that. In fact, her consultants aren’t even purchasing enough products to make that much in net profit. If you want to know how I know these things, here’s an old story from the days when directors and nationals used to publish numbers for the world to see. (Then they realized I’d use these numbers against them and they stopped.) This area had 27 units in it. With all those units, even the top 50 consultants didn’t order enough to make $5,000 or more per year even if we assumed they sold everything they ordered and sold it all at full suggested retail. Dacia’s next lie is that the average sales director makes $1,500 to $20,000 per month. Sigh. No, Dacia, she doesn’t. And you know that too. Most sales directors struggle to make the minimum monthly production of $4,500 wholesale. If you make the monthly production, and if all of the production comes from personal recruits of yours, you’d get commission of 26%, which would be a commission check of $1,170. Most sales directors don’t get there. They’re feeling good if they get a $1,000 commission check. Oh, that’s right. They make money from their personal sales. That adds to the income too. And maybe they’re a car driver? Sure, that adds to it too. But don’t forget about the fact that if their unit comes up short, they take some of these earnings and sink that money back into a product purchase to make the minimums, so that reduces what they’ve made. Dacia made up these numbers… and therefore, they’re more false earnings claims. And then Dacia’s lie about the average NSD income of $10,000 to $100,000 per month. Guess what? 39% of the NSDs make LESS than $10,000 per month. So much for Dacia’s average. Oh sure, I suppose that technically if you take the average across all of the NSDs, the super high incomes at the top balance out what little those NSDs at the bottom are making. But don’t tell me that those 39% at the bottom feel happy about their non-executive, less-than-$10,000 per month earnings that she’s touting on her website. Don’t be fooled by these false earnings claims. Mary Kay Inc. doesn’t track these numbers on purpose. They know the truth. More than 99% of people involved in MLM lose money. MK doesn’t want to have the data that backs that up. They prefer to remain ignorant. Pretend they don’t know the truth. Pretend that you “could” make money if you wanted to, and that women really want to have fun and maybe make a little extra money. The ’80s called. They want the outfit back. Let’s hope they didn’t let their credentials expire after leaving their jobs for this lucrative opportunity. UGH!! LOL!! You beat me to being the first to comment about that awful outfit! Who would wear that? And to think she’s serious? Oh…. LOL! I’m guilty of having worn a few cringe-worthy outfits back in the day, but the “serious business woman” caption was just too funny. The sad part about it is that people don’t find out that the earnings projections are a lie until they invest time, money, energy, more money, emotions, much more money, relationships and you guessed it… MUCH, MUCH, MUCH MORE MONEY. People… A FIFTY PERCENT DISCOUNT implies that you HAVE TO SPEND SOME MONEY. Nothing in life is free. And apparently Mary Kay isn’t free either. My Opinion about the Pic on Dacia: Isn’t her skirt too short? How can one be taken seriously when she is almost showing her “Hoo-Ha” via a short, short skirt? Just want to know. Another picture on her website has her in the same outfit standing by the pink caddy. That’s not a skirt, it’s shorts. Ugly, ugly shorts. How can she say $1,500-20,000/month income as a Director? Quite a broad range for the same position. That’s like saying someone working retail through an attorney’s incomes in comparison. Everyone needs to make a little visit to her site and see all the pictures of herself she’s using. When I met her, she had caked on foundation and carried herself with an ego, and these pictures validate she’s full of herself. Dacia, the University of FL has to be saddened to see your grammar usage, too. What a bad representative of their education. And you were going to be a teacher?? And The Random use of capitalization drives Me Insane!! Yeah, this is very sad that they are still using false income claims and getting away with it apparently. It is also sad that even in the 20/20 piece, Corporate rep. Beitler pretends nobody warehouses the product. It is one big elaborate, well acted con. The way the lies just drip off their lips is just stunning. It is all pie in the sky potential and not one bit reality. 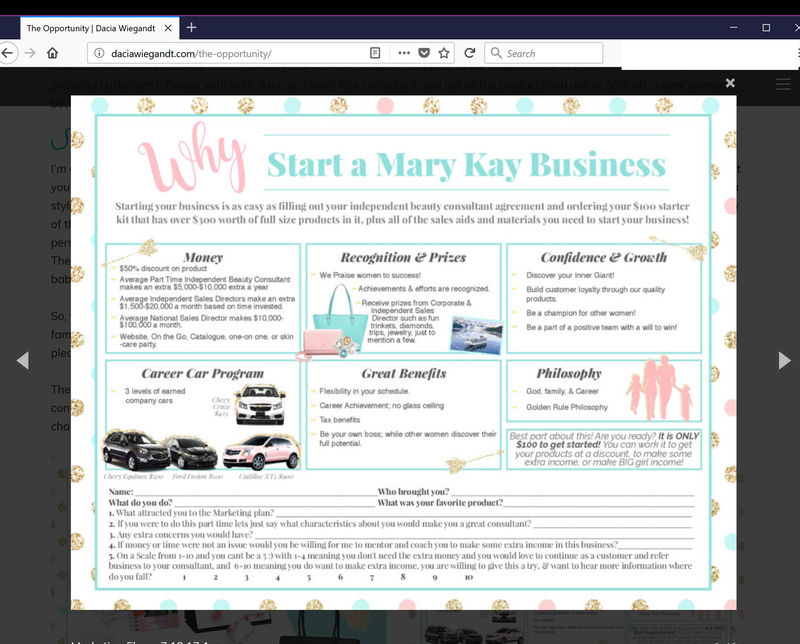 Sure, you can start a business today and make 200,000.00 a year in Mary Kay some day…but it won’t be by selling cosmetics, it’ll be by selling your soul. Let’s not forget Laura Beitler is an ATTORNEY. Who better to lie and deny than her?! Even the great GMB, as listed in Applause, is usually between 50-70 K per month, and she is number one in all of MK, so not sure where up to 100K per month for NSDs comes from? Unless you include their parallel pyramid schemes selling training, motivational, and leadership training videos to the people they already make commissions off of, in their income numbers. But that money is not from MK, it is from their other businesses, like Cyndee Gress’s Pinkice2. Totally shady. I thought they weren’t allowed to sell those anymore. The MK business model is not working for the minions and many have been stalled for years. More and more are launching websites (in addition to their MK unit sites) where they tout themselves as Direct Sales Coaches, marketing strategists, motivational speakers, etc. Yet she, herself, is still a SD after two decades. The only mention of MK on her website is a “Shop with Me” @ MK email. And while less than 39% are making $10,000 a month don’t forget to deduct expenses. Your friends will LIE to you to get you to join! And you will be on conference calls on Sunday nights. And events on Saturday mornings. All in addition to your unit meeting and own personal parties/”experiences”. My senior never reflected a lifestyle of balance, and her unit calendar still looks just as bad. Funny…she keeps claiming she’s going to be an NSD by Seminar. Again and again and again. She’s not even an Elite! How’s that schedule working for you? And my NSD always shamed us for not being like Dacia! She would tout Dacia became an NSD quickly because she did not know she couldn’t – gag. Now the NSD is competing year to year and month to month with her for commission in the rankings shown in the Applause. The NSD is retiring this year – yep can’t continue to compete with income going down. These NSD’s are ruthless and compete with each other, they only have the façade of being kind and nice. Such a role model in the business, who the heck wears this outfit touting riches just horrible. Dacia, I am sure LOVES that PT is discussing her, she will take any light that shines her way. Thank goodness for sanity in this website! I remember when Kimberly Copeland debuted and everybody clammored to find out how she did it. (She was Walker Roop then.). It was interesting how close she got to Pat Fortenberry and that no one could really pinpoint where the numbers came from. I’m glad I didn’t hitch my wagon to her star. Her makeup alone looks hideous. And she’s besties with Dacia. Surprise, surprise! I thought she was one who purchased a bunch of product in the name of all her downline directors? Or was that someone else? There seem to be so many who did that, it’s hard to keep track. You’re right, but I heard Pat Fortenberry financed hers and several of her offspring NSDs. There are second mortgages and all kinds of shenanigans just to assure everyone meets their production minimums and finish. I never looked at new NSDs the same again! And I also know of Directors taking out loans to requalify for their Cadillacs. Ridiculous! A recent post of hers says Directors are the “top 1%”. When I was in and there were about 15,000 of us, we were 2% of the 750,000 U.S. sales force. So, now there’s HALF the number of Directors at about 7,500? That ship is taking on water quickly! lol Thought we weren’t allowed to wear shorts/ripped jeans/dressing down is a no no. I definitely have been in trouble before for wearing leggings. So crazy! It’s the old Corporate Double Standard, you know. Rank and file do as they’re told, upper management do as they please. Just like there’s a “no alcohol” standard that gets dropped when you’re on a Top Director or NSD trip. And MK actually picks up the tab for those.